President Barack Obama and Secretary Hillary Rodham Clinton will address CHCI’s 39th Annual Awards Gala on Thursday, September 15, 2016 at the Walter E. Washington Convention Center. This will be the seventh year that President Obama has addressed the CHCI Awards Gala, going back to when he was a presidential candidate in 2008, and the second consecutive year that Secretary Clinton has appeared at the Gala. Don’t miss the star-studded lineup! The evening’s festivities will include the presentation of the 2016 Medallion of Excellence Awards to legendary comedian, actor, director, and artist, Cheech Marin, and community leader Anna Maria Chávez. Both honorees exemplify service, excellence, and a firm commitment to the Latino community. For sponsorship opportunities, contact Stefania Yanachkov, Director of Corporate Relations, at syanachkov@chci.org. 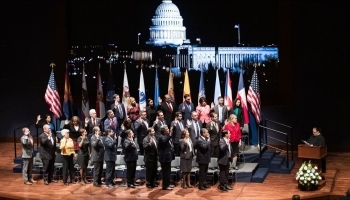 CHCI’s Swearing-In Ceremony & Welcome Reception Celebrated the Largest Class of Hispanic Members of Congress in History! CHCI Welcomes 38 Congressional Summer Interns to Washington D.C.